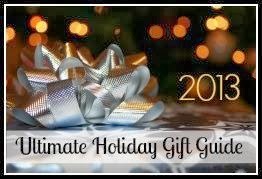 All gift items listed below have been reviewed by a member of our team and are recommended as this year's Ultimate Gifts to give AND receive for the 2013 Holiday Season. This list is being featured on multiple blogs throughout the M.O.O.N. Team. *If you are a company interested in being featured on this list please contact makeourownnetwork@gmail.com ASAP in order to secure a spot before the holiday arrives. We are still currently taking applications. **The above Holiday Gift Guide could not have been made possibly without the team over at Recomonk. I want to thank them for creating such a wonderful program and for putting up all requests and changes submitted by Randi from Make Our Own Network!